"Boo Ferriss was a great hitting pitcher. He was ambidextrous; he could throw left handed and right handed. Of course, he was a right handed pitcher. He had two great years, [and] then he hurt his arm. He would have been a great, great pitcher if he hadn’t hurt his arm. And a real class guy, real fine. "- Billy Hitchcock to Gene Fehler in, "When Baseball Was Still King: Major League Players Remember the 1950s." Dave "Boo" Ferris, who started his major league career with two consecutive 20-win seasons that led the Boston Red Sox to the World Series in 1946, passed away on Thanksgiving in Cleveland, Mississippi. He was 94. Ferriss won the third game of the 1946 World Series and was left with a no-decision in the deciding seventh game against the St. Louis Cardinals. Ferriss watched helplessly as Enos Slaughter made his famous "mad dash," to score the deciding run from first base on Harry Walker's double in the ninth inning. 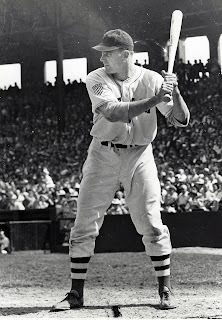 Ferriss indicated that it wasn't the World Series that was his most memorable baseball moment, but his victory in 1948 to force a one-game playoff with the Indians for the American League pennant. "It was disappointing to lose both the 1948 and 1949 pennants, after coming so close," he said to Fehler. "In 1948 I was pitching against the Yankees on the last day of the season. If we beat the Yankees and Detroit beat the Indians, Cleveland and us would tie for the pennant. I got in trouble in the sixth inning, I believe. The Yankees loaded the bases with Hank Bauer and DiMaggio coming up. I got Bauer on a sacrifice fly to Ted [Williams] in left field and got DiMaggio out and we went on to win the game. I think it was 10-5, and of course Fenway was going wild because the scoreboard showed Detroit was beating Cleveland. We did end in a tie and that brought about the first playoff game in American League history the next day, and sad to say we lost that. Gene Bearden beat us 8-3 there in Fenway. But it was a memorable moment for me, going into that game that had so much riding on it at the time." Perhaps much greater than his 65-30 career record with the Red Sox, was his impact on the baseball program at Delta State University. With his pitching career cut short due to arm troubles, Ferriss moved on to the collegiate ranks, literally building up Delta State's program from the field level. Six-hundred-thirty-nine victories and three Division II World Series appearances later, Delta Stats acknowledged Ferriss' indelible impact on the program by naming the baseball field after him when he retired in 1988.